Classification of image into 9 categories are divided based on the Color Psychology and Cognitive Science. This approach is used to extract the image in your head, which are sensuous and cannot be quantified. In order to simplify things, we picked 9 Chinese characters to represent the 9 categories:「AI / 愛」「RAKU / 楽」「KA / 華」「SO / 素」「SHU / 趣」「KAKU / 格」「YU / 優」「HIN / 品」「RI / 理」. “AI / 愛” represents loveliness, “RAKU / 楽” happiness, “KA / 華” gorgeousness, “SO / 素” simpleness, “SHU / 趣” tradition, “KAKU / 格” Dignity, “YU / 優” gracefulness, “HIN / 品” elegance, and ” RI / 理” urbanity. Each Chinese character is the keyword of each category of the image. 9 image classifications are used as scales of image. It enables to extract scent, flavor, feeling, or corporate logos and packaging of products from a basic image of designs of shapes, patterns, fonts and textures. Word Association Test9 (WAT9) is a software that has developed using the idea of the 9 image classifications as scales. First, users set the theme and choose the most appropriate adjectives, which are thought to match the theme that has set, from a list of 117 adjectives (or, from the selected 45 adjectives). After the participants responses have been recorded, the results are displayed with a variety of visual styles. Analyzing the colors of natural landscape and artificial materials is one of the important processes in designing. Conventionally, a single color has been chosen to represent the color of the object. To do so, wide range of knowledge and experience of colors are required, and thereby, it has been considered as a challenge. Image Analyzer is developed to resolve this difficulity, and enables users to analyze colors from picture images easily. 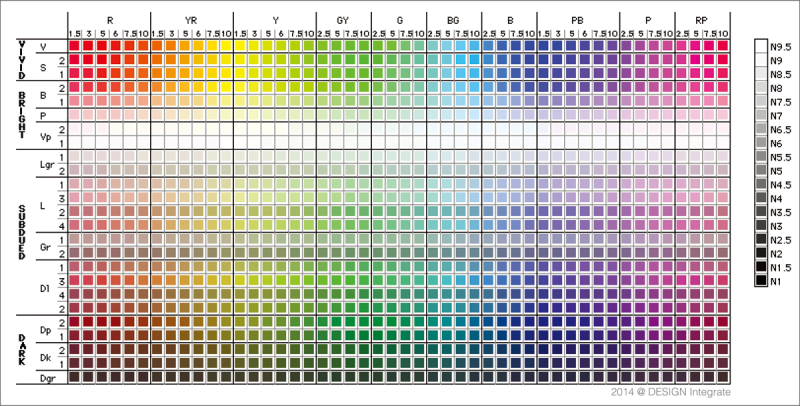 In this software, 1,218 colors are digitalized based on Munsell coller system; 1,200 chromatic colors (48 color phases and 25 tones represent brightness and chromaticness) and 18 degrees of achromatic colors. Color distribution can instantaneously be output from a JPEG image as appearance frequency information. © 2015 DESIGN Integrate. All Rights Reserved.